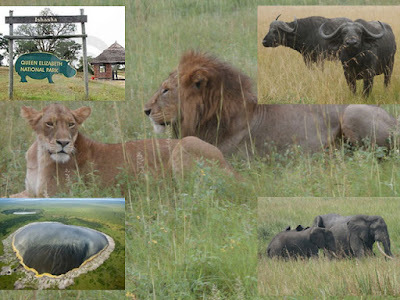 Queen Elizabeth national park is understandably Uganda’s most popular tourist destination. The park’s diverse ecosystems, which include sprawling savanna, shady,humid forests, sparkling lakes and fertile wetlands make it the ideal habitat for classic big game, ten primate species including chimpanzees and over 600 species of birds. As well as its outstanding wildlife attractions, queen Elizabeth national park has a fascinating cultural history. There are so many opportunities for visitors to meet the local communities and enjoy storytelling, dance, music and more. The park was founded in 1952 as kazinga national park and renamed two years later to commemorate a visit by Queen Elizabeth II. Depart from Kampala heading southwest across the country, through Mbarara town, the home to the impressive long horn Ankole cattle. On the way see the royal drum makers, stand on the Equator, bargain at the roadside markets. Descend to Queen Elizabeth National Park, keeping an eye out for game. A short game drive along the Channel track welcomes you into this park . The Channel track runs parallel with the Kazinga channel as you drive slowly towards the Katunguru gate. In the afternoon we will go for a launch trip along the Kazinga Channel. This gives you the opportunity to view wildlife up close: hippo’s huff and spray very close from the boat, buffalo linger in the shallow; elephants watering, and many other wildlife. At least 80% of the wildlife in Queen Elizabeth national park can be found along this Channel. The shores of the channel are also home to an array of birds including pink backed pelicans, pied and malachite kingfishers, saddle billed stork and many others. drive to your lodge through large expanses of savannah grasslands as you spot some wildlife enroute. We set out early in the morning for a game drive in the northern part of the park on the Kasenyi Track in search of lions, elephants, solitary buffaloes. This is the best time for opportunities of viewing the cats in action owing to the vast population of Uganda Kobs. After the activities we drive back to Kampala. Tour Price For 2days Queen Elizabeth National Park (These prices are just suggestive and may be lower or higher than the suggested. Tour cost includes: all park entrance and related fees, boat fees, Full board accommodation with all meals (breakfast, lunch and dinner), bottled drinking water on safari, private 4x4 ground transportation with an English speaking driver guide, guides in national parks. How to Travel from Entebbe International Airport to Queen Elizabeth national park within 2 hours. Popular tourist’s activities in Uganda-Game drive, boat cruise, and gorilla trekking.